I struggled at first to reproduce this as I thought it was just a standard image (no layers/effects etc.) but one of my colleagues recognised it and found the afphoto file. It looks like the White Balance has changed. The big however, is that White Balance is now working as it should so this will likely affect other user files with an existing White Balance when they open it in 1.7. If you are going to make a change like that, recommend that older files either have the white balance settings adjusted upon import to make them match the appearance of the older version, or if that is not possible, keep both versions of the white balance behavior with maybe a checkbox to "use legacy behavior" or whatever which gets turned on when older files are imported in order to prevent this from happening. It is one thing going from one beta to another, but this shouldn't happen when going from an official release to a newer official release. First of all happy and healthy new year! Can you provide the file here? If you can't do it publicly, Chris can provide a private upload link. Here's a private Dropbox link. It looks like there's a White Balance Adjustment in the Billboard_4_BG layer that is enabled. If I turn this off, release and beta look the same as far as I can see. I've attached some screenshots with White Balance enabled and disabled. I think the Soft Proof Adjustment might have something to do with it as well. If I turn off all the layers apart from the background layer (very bottom layer) they look identical. I'll do some more poking and let dev have a look. Thanks for your time. We've done some more tests on lots of screens and hardware and the only difference we are seeing is when an adjustment has been applied. If we just open a JPEG or a RAW, they look identical. The Histogram looks different but this is due to Andy Somerfield's change - Fixed histogram statistics (was including alpha channel in calculations incorrectly). 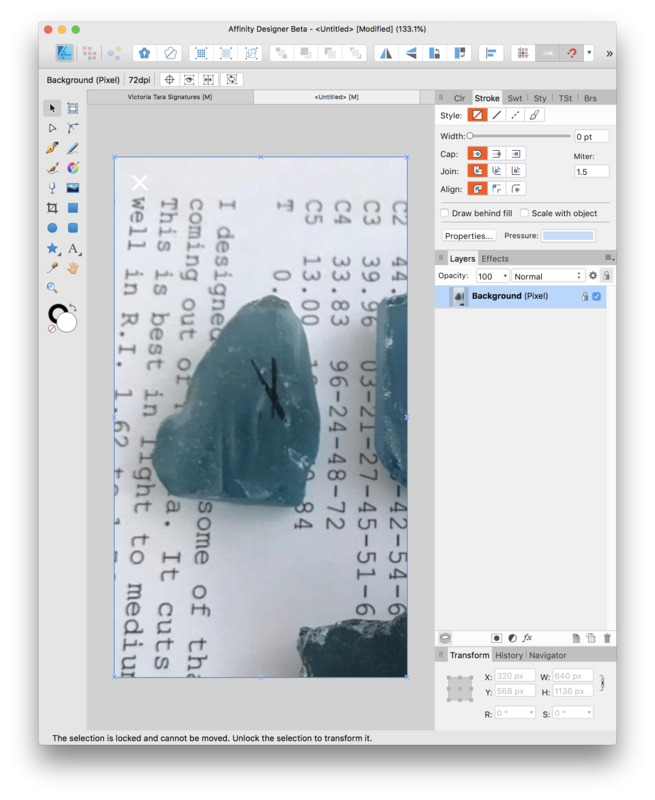 We can see a clear difference once we start to apply Adjustment layers because some of them have been tweaked or completely rewritten. 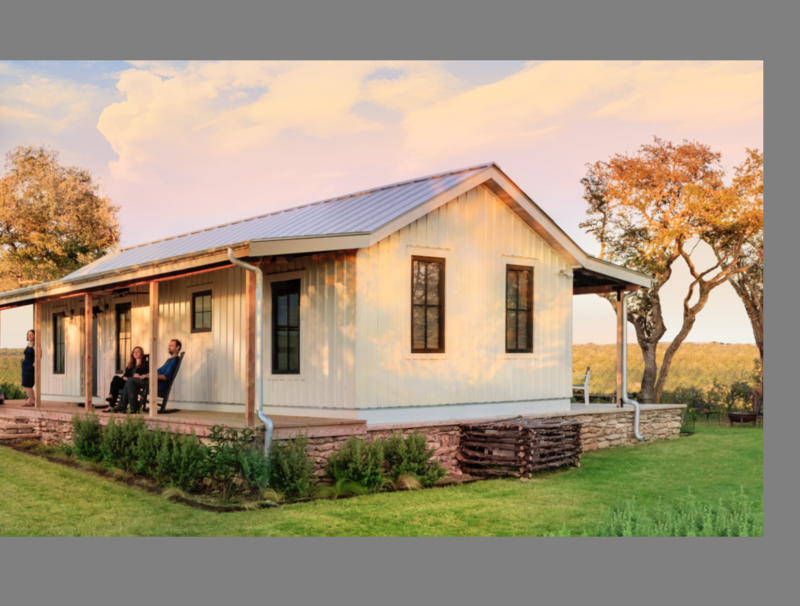 If you're developing a raw, the change you are seeing might be due to - The RAW processing engine in Photo has been rewritten - producing better results and improved performance. It also takes advantage of the GPU architecture changes described above. It's curious that I still cannot see a difference without any adjustments present if this is the case. I'm not trying to be difficult, I just can't see a difference on my Macbook Pro or the 5k retina screen or the 4k Dell screen I've checked on unless I apply the adjustments. I would argue the differences you are seeing are now correct and are because of all the fixes in this list. 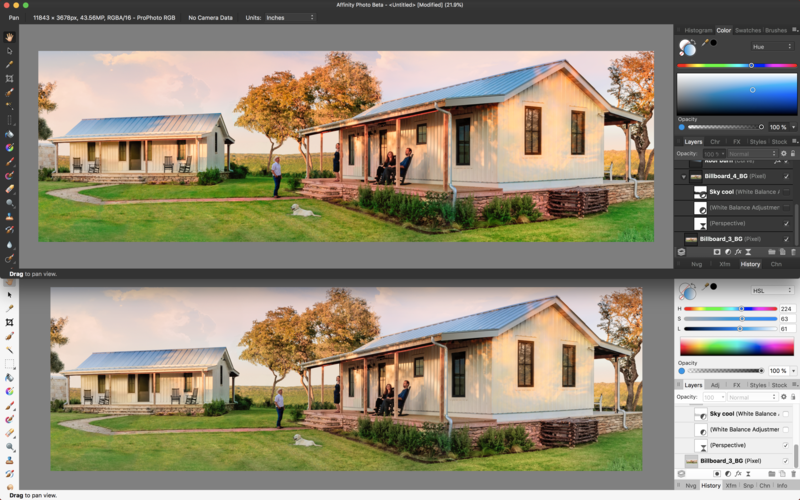 Well, I just opened an unedited JPG in both betas, no adjustments, and the color is hotter in APbeta than in ADbeta. So your theory is not correct. It doesn't seem to be about different computers, OS's or anything else. I'm opening the file on the same Mac. It's in the way the betas are rendering color on my system. So what next? You have one in dark mode and the other in light mode. 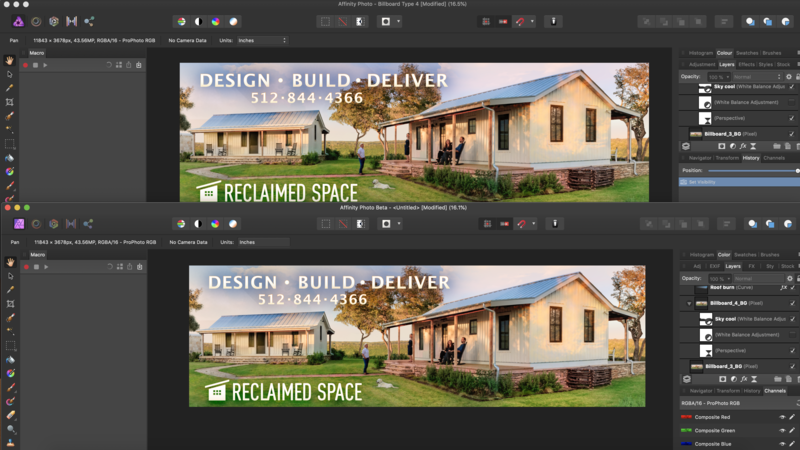 Your screenshots suggest there is an sRGB versus Adobe RGB discrepancy happening. If the screenshot of AP is assigned sRGB profile and the screenshot of AD is assigned Adobe RGB profile, then the colours match in the document views of the apps. 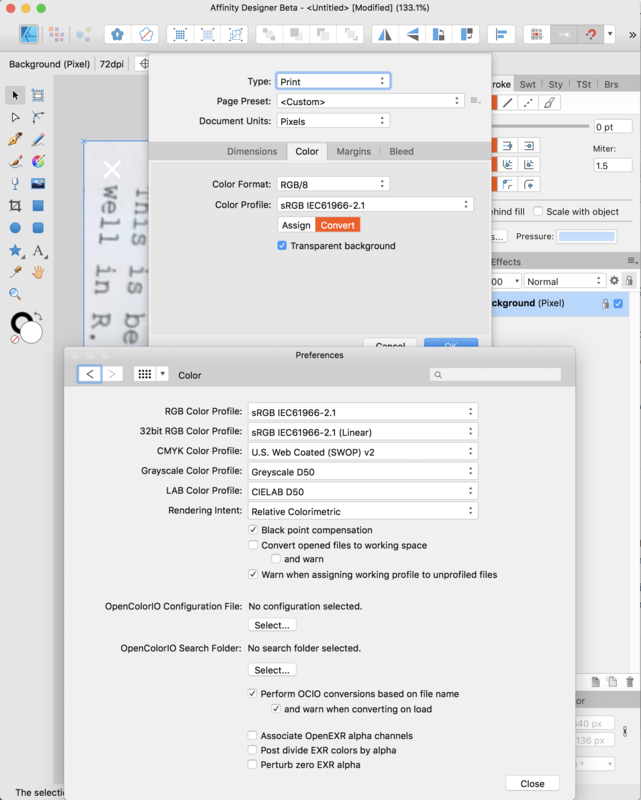 We can see that the document profile is sRGB in AP, but we can't see what document profile is being used in AD. We can see that the documents in both AD and AP are untitled and have been modified, so you haven't simply opened an image file from storage into the apps. A guess would be that New From Clipboard has been involved. 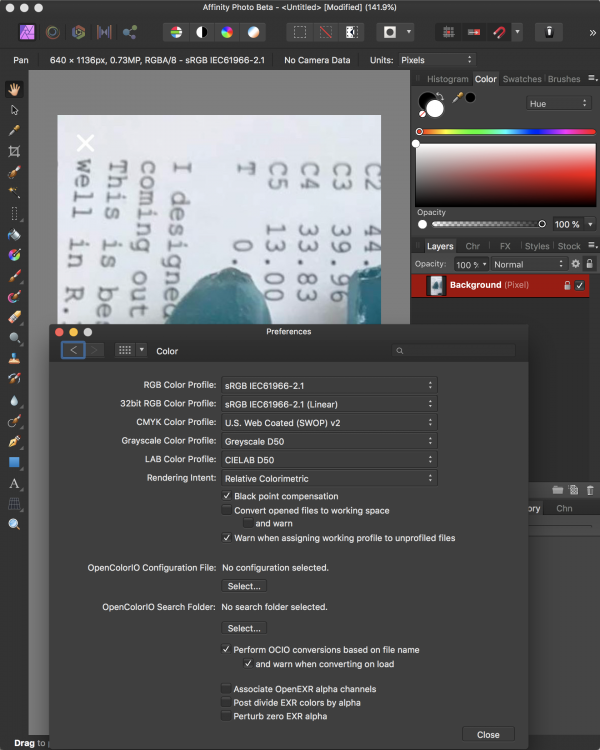 If we had a screenshot of the colour preferences of both apps and knew your precise workflow up to the point of grabbing the screenshots, then we might be able to work out why the discrepancy is happening. As I mentioned, I have not changed any color settings. 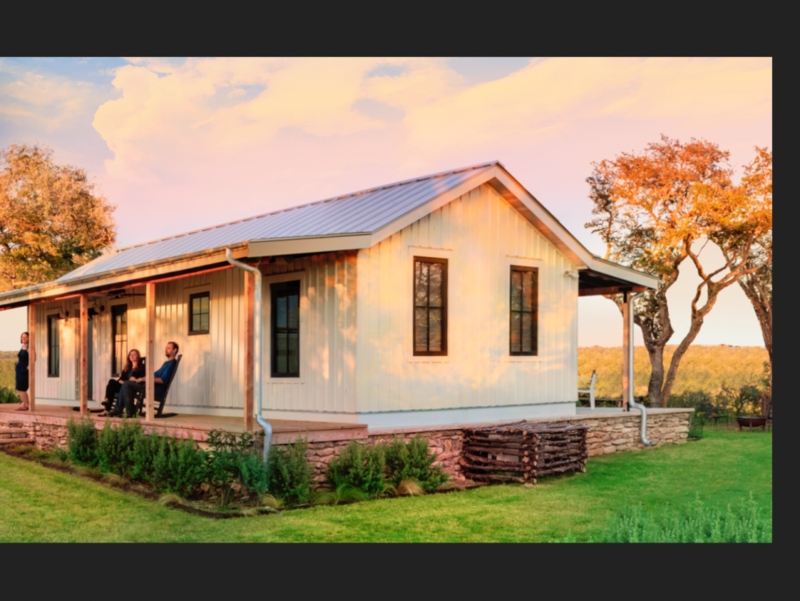 Using Apple's Photo software, I selected "Edit in > Affinity Photo Beta. I noticed the colors were hotter. Then selected "Edit in Designer from APbeta. I noticed the image color was less saturated in ADbeta, so I took a screenshot. Then I sent it back to APbeta using the "Edit in Photo" command in ADbeta. Then I took a screenshot. I made no modifications to the image, so you are incorrect in assuming that I made modifications. Additionally, I did not use the "New from Clipboard" command, that's another incorrect assumption. The image is labeled "Modified" once it is sent to AD via "Edit in Designer" command in APbeta. Attached are the Color preferences for both apps, with the loaded image in the background, precisely using the workflow I described above. I have made zero changes. 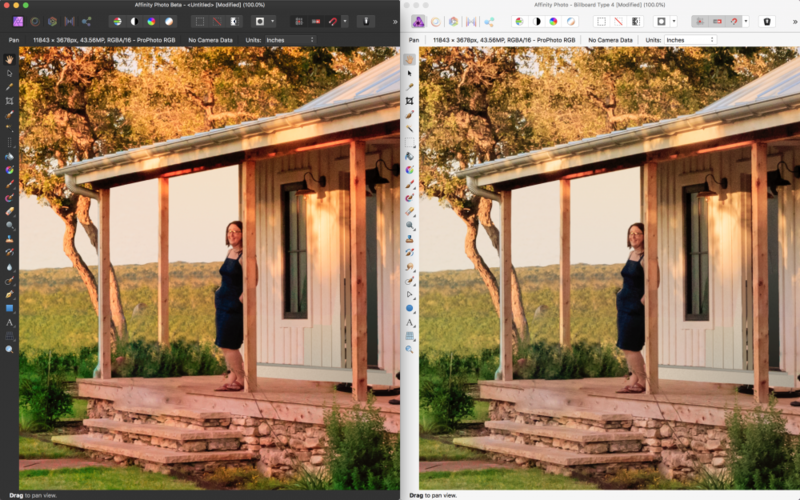 Additionally, I exported the file from Apple Photos and saved it to the hard drive and ran the workflow described above, and I get identical results: APbeta makes the colors hotter. This is not the only file this has happened in. I made another thread with a much larger file and get the same results. 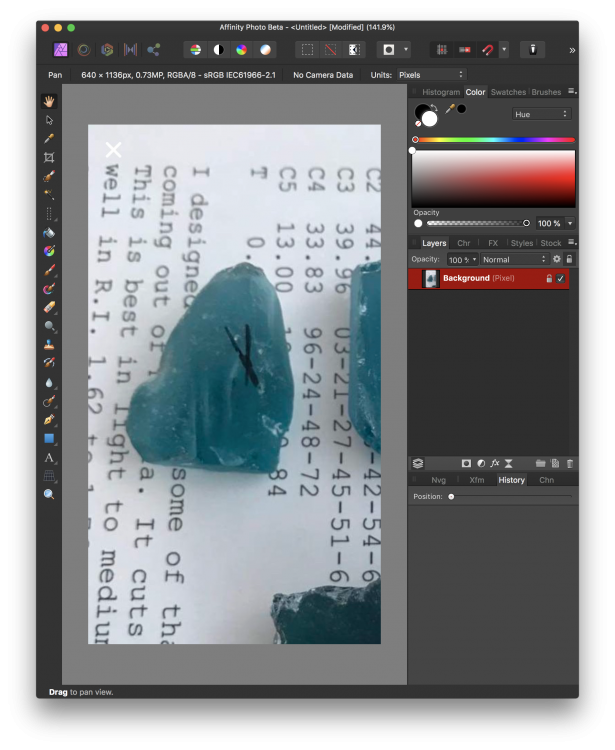 Using the Finder's Quicklook command, I noticed the file colors corresponds with ADbeta's rendering, not APbeta's. Apple's Preview app also renders the file like AD. So, it seems to be something in APbeta. Now what? Why the confrontational tone when I'm trying to help you? I've heard countless times when problem solving for colleagues that settings have not been changed from default, but often they have been changed and forgotten about, so I asked you for screenshots to see exactly what your settings are. I never assumed or stated that you had knowingly modified the appearance of the documents. I stated the evidence that you had not directly opened a file from storage into the Affinity apps, and you have now confirmed that. Furthermore, I never assumed that you had used New From Clipboard. I explicitly said that was only a guess as to why the document is untitled in both apps. I think you should simplify that workflow. 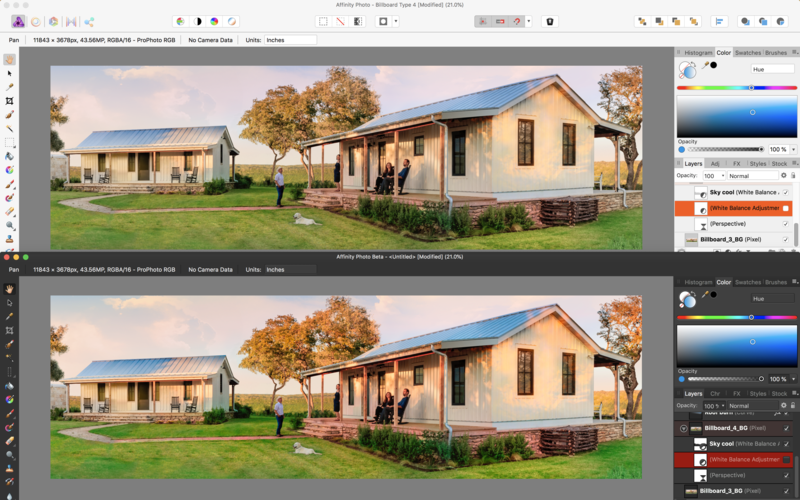 Just have Photo beta and Designer beta directly open the JPG file. But also, as suggested by someone else, please reconfigure both apps to use the same UI, either both dark or both light. As it is now you leave too many possibilities for what could be happening. @>|< Thank you for trying to help. I wasn’t being confrontational, just clarifying facts. You made incorrect assumptions. So i pointed them out to rule out thr issue. Furthermore i have tried direcectly opening the file saved to local drive and got the same results. That’s why i wrote that in the last paragraph of the previous reply. I also included the Color Settings as you requested. Perhaps it’s about defensive listening more than a confrontational tone? Regardless, thanks for trying to help. Goodbye. I tried opening the files directly in both apps and get the same results. The interface difference is not a factor. I tried that as well. Thanks. I believe Sean may have spoken with you in another thread where Photo and Designer are rendering colours differently. We have confirmed this and he has logged it with the developers, so thank you for that. I really am not sure what's going on there. However I am still unable to see a difference between 1.7 and the released 1.6 versions which is what this original post was about. @Chris B I updated to the latest AD and APh betas and they still render the same file differently. Beta is too saturated. There is only one layer in the file. What do you suggest to help troubleshoot this?